Looking for a safe, natural deodorant that works? This DIY All-Natural Detoxifying Deodorant is a tried-and-true favorite among Body Unburdened readers. Not only does it stop odor naturally, but it contains an ingredient that actually helps to draw impurities from the skin. Plus, it’s so easy to make with just a few simple ingredients! A check-my-email-while-brushing-my-teeth, cook-dinner-while-catching-up-on-Downton-Abbey type of gal. Which is why when I finally bit the bullet and made a homemade deodorant, I decided to take it beyond all-natural and add a powerful detoxifying ingredient that actually pulls toxins from the skin. Oh, and it works. As in no odor and reduced sweat (no natural deodorants completely stop sweat). Here’s what some Body Unburdened readers have had to say about the DIY All-Natural Detoxifying Deodorant over the years! 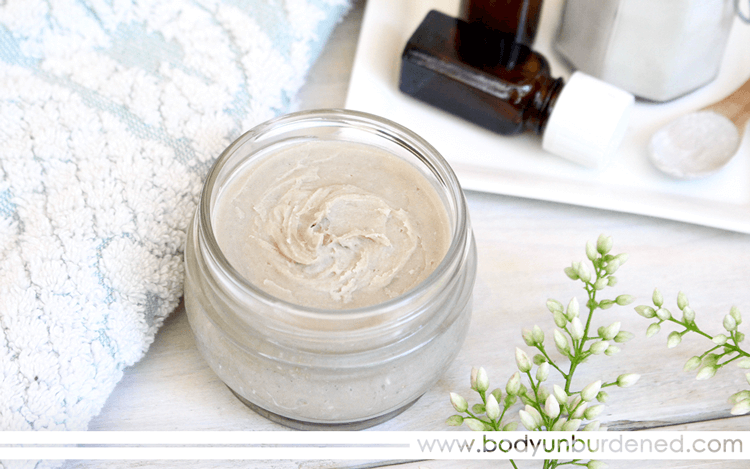 Bentonite clay is the all-star of this homemade deodorant recipe. It’s one of the most effective and powerful healing clays. It has the amazing ability to attract and bind toxins and impurities. Bentonite clay also has a very fine velvet-like texture, is odorless and non-staining… which are all very important qualities for a deodorant! Clays also quickly and easily absorb moisture. Looking for a safe, natural deodorant that works? This DIY All-Natural Detoxifying Deodorant is a tried-and-true favorite among Body Unburdened readers. Not only does it stop odor naturally, but it contains an ingredient that actually helps to draw impurities from the skin. Put the coconut oil in a large mixing bowl. If the oil is hard (since coconut oil has a melting point of 74°F, it may be solid or liquid depending on how warm or cool you keep your home), mash it with a fork to soften it a bit. Then add all of the other ingredients. Mix everything together until you have a smooth, consistent paste. Lastly, simply transfer your deodorant into a small jar. To apply, simply rub your finger on the top of the paste to warm it a little, and scoop out a small amount to rub on your underarm. The paste will “melt” (as coconut oil does) right into your skin and absorb rather quickly. The tea tree essential oil may be a bit overpowering while mixing everything, but has just the right amount of scent when applied to the underarms. Rosemary and lavender essential oils also have antibacterial properties and so could be used with or instead of tea tree oil. Troubleshooting: Skin irritation from natural deodorants. Baking soda can irritate the skin by throwing off its pH. Baking soda has a more alkaline pH (8) while the skin’s natural pH is slightly acidic (5.5-6). So if you experience irritation this DIY deodorant recipe or from any natural deodorant that contains baking soda, that’s the likely culprit. Rebalance your skin’s pH with apple cider vinegar. Make a mixture of 1 part ACV to 2 parts water, and dab it on your underarms with a cotton ball. Reduce or remove the baking soda from the recipe. While this may affect the effectiveness, you can certainly give it a go and see if the recipe works for you even without the baking soda. Awesome! Do you use a coconut oil base as well or other ingredients? Bentonite clay is amazing. Please let me know how it goes! I was using just plain baking soda for years and suddenly it burns my skin. I can’t even use cornstarch now. I am desperate for a homemade deodorant that will work but not burn me. Every homemade recipe I have found calls for the baking soda and/or cornstarch or arrowroot. Sandy, I know what you mean! I gave this to my boyfriend but the baking soda gave him a huge red rash. I am going to try to make one without the baking soda. Now you have inspired me to get on it!! The cornstarch and arrowroot irritate you as well? I’ve been using a spray of filtered water and tea tree oil followed by coconut oil…I happen to have all of the ingredients for this-I will have to try it! I’m currently using microbial silver deodorant. Might try looking into that. Pingback: The glorious month of MAY! Pingback: Friday Happy Hour #39 - Oh Lardy! Where do you get your clay from? I’d LOVE to try this. Been using raw organic apple cider vinegar, which neutralizes the odor, but often leaves me smelling like freshly decorated Easter eggs—lol. So I’d love to have an alternative. Where do you purchase your bentonite clay? Hi, Kelli! I buy mine at a local store, but you can buy it online at Mountain Rose Herbs (http://bit.ly/11129d9) which distributes great quality products (I buy their loose teas in bulk!). Hi, Trudy! I buy mine at a local store, but you can buy it online at Mountain Rose Herbs (http://bit.ly/11129d9) which distributes great quality products. And I totally know what you mean about vinegar triggering memories of dying Easter eggs LOL… I can’t clean my bathroom without thinking of it since I use a vinegar cleaner! I make my son’s deodorant (I don’t use deodorant, I just spray magnesium oil in my pits) and I thought of putting some clay in the recipe, but I thought it would leave a chalky residue in the pit or on the clothes. Have you experienced this at all? Hi, Wendi! No, I have never had a problem with this recipe leaving any residue. Just be sure to rub into well into the skin and let it dry for a minute or so before dressing. Nadia, yes I am also irritated by cornstarch and arrowroot under the arms. I found a recipe for a deodorant without any starches or baking soda, but it doesn’t work for odor. I had made the baking soda recipe, and it is so effective except for the rash and irritation that lasts for 2-3 days after using. I am wanting to find out if there is any type of purified baking soda out there somewhere to try. I am getting desperate!!! Wow, that’s awesome! Thank you! I have found that pure extra virgin coconut oil works very well for odor. No irritation or anything. The only drawback is that it doesn’t help the wetness. Hi, Erinn. Oh no! I’m sorry to hear that. Others also have a sensitivity to baking soda. If it is JUST the baking soda, give this combo a try with all of the other ingredients and just leave the baking soda out. For some people, JUST coconut oil works for them – maybe you are one of those lucky folks! I just use equal parts baking soda and arrowroot powder. (inexpensive & easy). I then add water to mix it together and then I apply the goop, let it dry, and brush off the white powder before getting dressed. Joy, you should really try adding the coconut oil to the mix! A jar or organic coconut oil is about $5, and would last you a very long time if used just for this purpose. Great idea and I would love to try it. However, in trying to print it, and to save paper, I like to select only the text I need to keep to save paper, but your page does not allow that. That’s a bit frustrating. Thank you for the clay idea. I make CO & baking soda deodorant and very pleased. I will add Bentonite, but am VERY allergic to Tea tree. Unfortunately, it will not allow me to copy this so I can print it off. It is a lot to write down. Hi, Becky. I just added a print button at the top of the post – check it out! Thanks for bringing this to my attention. What about stains on clothers with this recipe ??? Hi, Flore. As I mention, the bentonite clay is non-staining. I do sometimes get a little powdery-looking residue on my clothes, but it rubs right off. I asked this question because you use coconut oil and essential oils on this recipe. Ah that makes total sense and I am surprised I have not received this question yet! This was a concern of mine when I first started using coconut oil (I also use it as a body moisturizer). I have personally not had any issues with it (or the tea tree in this recipe) staining my clothing. When you do a simple Google search for whether or not coconut oil stains, the reviews are mixed – some say that it does not stain while others say it does. Like I said, I rub it ALL over my body, not just on my underarms, and have never had an issue. Just tried this for the first time today… pleasantly surprised that it WORKED! So far anyway 🙂 I’m going to keep trying it this week just to *make sure* – but I’m very, very pleasantly surprised! Thanks!! Oh, Shannon, this made my day!! I hope it continues to work for you. Agreed – you definitely have to rub it in and let it soak in before dressing. I have personally never had any staining issues. Can I replace the bentonite clay with something else or just not use it? I have all the others ingredients but not the clay. Love love your blog – keep up the great work. Definitely. I use it primarily for the detoxifying effect. It also helps to absorb some moisture. But some people use JUST coconut oil as a natural deodorant and swear by it! Plus baking soda does a wonderful job of absorbing odor. I would recommend NOT using baking soda on the skin. The skin’s pH is roughly 5 (acidic) while baking soda’s pH is over 8 (alkaline). Our skin is *supposed* to be acidic to ward off harmful bacteria….which includes the smelly kind. Bad bacteria thrives in an alkaline environment. This is why using diluted raw organic apple cider vinegar on the skin is ideal – its acidic pH is the same as our skin. That being said, I think this would be a great DIY recipe without it!! I love everything about this recipe…except the rubbing it on with fingers part. Would it work, do you think, to heat the coconut oil just enough to make it liquid, add the other ingredients and pour into a re-purposed deodorant stick container? I’ve done that with a similar recipe that only includes coconut oil, baking soda and eo’s. But I’m trying this because like the idea of the clay…but perhaps that addition will make it too think to pour? Any thoughts you have would be appreciated! Great blog! Love it! Oops…* meant to say, “to thick to pour”…sorry! Yay! I’ll check back and see if you had any success! Thanks for the response! Hey there! Just wanted to update. I’ve been using this recipe since July, and have loved it up until the last couple of weeks. I wanted to run this by you and your followers and see if anyone has had the same problem/can offer a solution. I made my first batch in July and commented above. I loved it for a couple of months – up until last week, actually, when something strange started to happen. When I wore the deodorant, toward the end of the day I noticed huge “salty sweat rings” under my arms on my clothing (if that makes sense). Now, I will say that two of the times I noticed it, it was with bright clothing (one red shirt, one bright blue shirt), and the last time was yesterday and I was wearing a pastel striped shirt. The first time it happened, I just thought perhaps the deodorant was reacting with the dye in the shirt (it was a new work shirt), but then it washed out… and it’s washed out each time. The problem is, I’m a 4th grade teacher and am on my feet (and sometimes sweating) a lot. I can’t have my pits looking like huge salty sweat rings. I was so bummed when this happened because I thought that FINALLY I had found an all-natural deodorant that ACTUALLY worked for my sweaty self. Have you ever experienced this? Could it be that the batch was just “old”? Could it be that since it was the bottom of the jar (I had stored it in a glass baby food jar) it wasn’t mixed as well? Any help is appreciated! I definitely don’t want to go back to commercial deodorant, but I also don’t want to have ugly salt rings on my work clothes. Hi, Shannon. Boo that stinks!! I haven’t had this problem. Perhaps since it’s the bottom you are getting less moisture/coconut oil and more of the clay, arrowroot, and baking soda and this is the reason? Maybe you could add a little coconut oil to what you have left and see if this solves the problem? Let me know! Shannon, I was just going to leave a message to ask her that same thing: does it lose it’s effectiveness?? Everything I’ve tried store bought that was natural worked for a little while, then stopped…some after only a week! Yesterday at soccer practice I had huge sweat rings and I had just put deodorant on beforehand…personally, at home, I couldn’t care less…but it IS embarrassing to look like a sweaty mess in public!! And, living in SC, sweat is abundant. If it’s a case of make a new batch every 2-3 weeks I get that…and I’ll probably make it just so it’ll last however long it’ll last…I think that was my frustration with the store bought deodorants…I don’t mind forking out the money for stuff that works, but don’t want to pay all that for something that doesn’t do any good…So, that being said, Nadia, how’s it still working for you?? Is it just an old batch issue?? Thanks!! I haven’t made a new batch since I made this first in April and don’t have any problems! In the past I have had an issue with deodorants loosing effectiveness after using them for awhile, I think just as my body became adjusted to the formula. But this has yet to happen with this deodorant for me. like other deodorants or would the recipe need to be adjusted. I make my own deodorant…..so I thought I would give this a try since I have the clay on hand. It wasn’t until AFTER I added the clay that I wondered why no one had talked about the fact that this would RUIN your clothes. Other recipes (without the clay)? YES! This recipe that will ruin your clothes? NO! I don’t understand. Do you think it was the clay? I truthfully have never had an issue. The coconut oil leaves a little bit of a wet look, but it washes right out. This recipe didn’t stop the odor. I am highly allergic to tea tree oil, lemon oil and lavender so I’m cautious about using essential oils. Plain coconut oil works for a little while but not enough. Any suggestion? Need some advice on this recipe. I made this last night but my deodorant has not solidified. Measured out the ingredients as listed. Any ideas! Where did you get those beautiful glass containers. Love it. Hi! My local natural food store only have powdered bentonite clay and I was wondering if that would work just as well if I added a little water to it or if I should just buy the actual clay? Hi, Sierra! Yes, powdered is perfect! Okay! Thank you very much! Would it work with most(if not all) of your other DIY things? Have you ever tried, or thought of, using green clay instead of bentonite clay? Do you think this would work just as well?? I also tend to get a rash when these ingredients are mixed together in a cream/lotion. However, I have had a lot of luck and success over the past two months with these ingredients used in another way. I swab my armpits with witch hazel using a cotton ball, grab a quarter sized amount of virgin coconut oil and melt in in my hands then into my armpits. I mix the dry ingredients of arrowroot powder, baking soda (I use a tad less than recommended), and the bentonite clay powder together and put in a recycled spice bottle. I simply apply it on top of the coconut oil using a powder puff and I stay odor-free and relatively dry even when I am sweating doing housework. Doing this got rid of the rash I got from the cream in a few days and this dry form has worked very well for me. Just FYI. Thanks for letting us know, CeLeste! I’m glad you were able to find a way of going DIY that works for your skin and WORKS! Hi, Kayla. Good question. I use green clay on my face as a mask (mixed with bentonite actually). Both are great “absorbers” (not sure if I made that term up!). But bentonite is known is be especially great for detoxification purposes and absorbing heavy metals – such as aluminum which may be still lingering around our pits due to previous antiperspirant use. Also, bentonite is nonstaining and a pretty neutral color – not sure how green clay would fare! Hey! I just wanted to tell you about my results while using this recipe. I made it almost exactly by your recipe except I added a vitamin E capsule and used Rosemary instead of Tea Tree Oil. (I don’t really care for the smell of Tea Tree Oil.) I use it every day and have really enjoyed it. Lately, I have noticed an added effect though. I have, for years, had a few tiny skin tags under my arms just outside the underarm area. SURPRISE! I started to notice that they were getting hard. Then, the other day, they fell off! I am attributing it to the bentonite clay but just wondered if you had ever heard of this before. What a welcome surprise. I love your site. Please keep it up, I am telling all of my friends and family about this. I have tried many homemade deodorants and this is my favorite so far. I didn’t even have to reapply after working out! Baking soda tends to make my skin itchy after a few days of using it, but when I start to feel that itchy feeling I use a mixture of water and apple cider vinegar. Just dab it on your pits and let it dry. I had to use another deodorant as this one was so itchy after a couple of hours…I may try the apple cider combination. Oh no! You’re probably sensitive to baking soda. You can try limiting the amount you put in – some people use JUST coconut oil, so with the tea tree, clay and arrowroot, you may get good coverage. I love this recipe! the deodorant works so well, and I love how it smells like a spa. My husband and I have been using this recipe for a little over a month now. We have both noticed that our arm pits have started to hurt, kinda like the muscle feels sore. Has any one had this happen to them since they’ve been using it? Hi, Ashly. I’m sorry to hear that. You are most likely sensitive to the baking soda. Have you tried other deodorants with baking soda before? I made and have been using this deodorant for a few months now…and I love it! Thanks so much for the recipe! My only complaint is that it does leave a stain on clothes…especially light or white colored materials…which I was afraid of when I saw the gray/green bentonite clay. My question is whether another clay, ( a French white or pink clay) has any of the same or similar beneficial detoxifying properties as does the bentonite clay, and therefore wouldn’t leave the gray stain? I love this deodorant, and I love the detoxifying aspect of it. I just am not pleased with the way it stains clothes…and it does not wash out! I’ve tried to research and google whether other clays would also help detoxify, but can’t come up with a definitive answer. I’ve also made a similar coconut oil/baking soda deodorant without the clay, and it’s ok too. But I really like the idea of the detoxifying element of your recipe! Any help or suggestions you can offer would be greatly appreciated! Thanks so much! Hi Nadia, I read through all the comments before and after trying this recipe, but I’m not sure I’ve found an answer to my problem yet. I made this deodorant and put it in 2 containers for my mom and me to try, and it did a great job the first 4-5 days. Then we both started noticing how much our armpits hurt/burn and we both have big red bumps. I told her that maybe we just need to ride it out and it’s a transitional phase (what with the clay now pulling out toxins instead of them being trapped by anti-perspirant deodorant). I know other people on here have had a sensitivity to baking soda, but I’ve used baking soda on my skin before without issues (deodorants, exfoliants, etc.) I told my mom maybe we should leave out the baking soda next time, but she’s concerned about odor control if we do that. Do you have any suggestions for us? I really love the idea of this deodorant and don’t want to go back to anti-perspirants. Thank you! Hannah, I’ve been using this recipe for a a couple months (LOVE IT). I also found that I was getting bumps and burning, and with some trial and error have discovered it has to do with whether or not I shaved before putting it on. If I shave and immediately apply the deodorant, I find that I have a reaction. I’m not sure why this is. I’ve started to shave my armpits at night so that I don’t feel the need to apply the deodorant until morning. Since making this change, I’ve had no problems. So anyway, something to consider! I made this and have added it to our deo rotation. We keep a spray bottle of alcohol (ever clear or golden grain) with EO, a container of plain coconut oil, and a jar of this blend handy to keep our bodies guessing and relief from any of the iffy ingredients. The blend is very dry, tough. I found heating for a few seconds with a hair dryer helped soften to apply. I also noticed sometimes while rubbing it in, that dry bits flake off. It’s like the oils are soaking in leaving the powdered ingredients to slough off. Maybe I need more coconut oil. Overall a good experience so far. Keep up the good work. Baking soda has alkali PH. it’s increasing your skin PH up to unhealthy numbers. Maybe not in one day but it will happened. Sweat bacteria love alkali environment. You can substitute baking soda with more clay and zinc oxide. I don’t seem to be able to find your eco print option! Please Help! Oh yeah, I don’t think I have one! But you can always just copy and paste it. is it possible to add a small amount of beeswax ( or some other ingredient ) to this recipe to harden it slightly and put it in a regular deodorant container? I’m allergic to coconut and tea tree oil. Any suggestions? Right now I’m using 2 or 3 different deodorants to get good results and sometimes that doesn’t help! I LOVE this recipe! I’ve been using it for about a month and it works like a dream. My husband and I went for a 6 mile hike yesterday (in the deep south) and I still had no odor! I poured mine into an old deodorant container while it was still warm and use it just like any other deodorant. Very easy and it works!!! Aughh I have tried using baking soda on my armpits…various recipes….I have had to endure “pits of fire” for weeks!! I’ll be trying this recipe soon for sure! I made the typical baking soda/arrow root/coconut oil one but am curious how the clay will work for me! Is this deoderant recipe sturdy enough to put in cleaned out deoderant containers so it can just be rubbed on? I’ve seen some that could be done that way and is very easy to use. Have never tried any recipe with the bentonite clay, but curious to see how it works. No, it’s not. You’d need to add some shea butter or bees wax. I just have to say a HUGE THANK YOU! Been using this for 2-3 weeks now. My left “pit” had a stinker smell to it for the past 6 months (not sure why) but this has cleared it up! Very happy because all the natural deodorants I purchase never really worked. This is the first natural deodorant I’ve used that works really well. I’ve tried several different brands and homemade concoctions with no real success. This mixture keeps my underarms dry and fresh. So excited! The cool thing about all the natural deodorants is that many things work as antibacterials, so whenever I find myself in a place where I need some deodorizing I can just look in the kitchen cupboards and often find coconut oil, baking soda, essential oils, alcohol, vanilla, honey etc. These can all be used plain in a pinch. Just rub them on then wait a bit and wipe blot/wipe them off. Kills bacteria, neutralizes odor, and you start fresh again. Looking forward to whipping up a batch of your diy deodorant at home though. Just wanted to say that getting rid of odor is a multi pronged group of lifestyle choices. It starts with eating a great diet and hydrating your body. After I started supplementing with Magnesium my body odor went down to near zero. Washing with water mostly and not with harsh soaps also helped. Finally I started dry bushing and using lymphatic massage to remove toxins in my lymph nodes (lots of these under the armpits) All these practices combined with minimal use of natural deodorant cream makes my body odor non existent. PS If you are right hand dominant you might find you left armpit stinks more. I asked my naturapath about this during a breast exam and she said that you tend move your dominant hand/arm more so you get more toxins out on the dominant side. This is the proof to me that movement of the lymph is important to get toxins out. It’s also good for our breast health because there are so many lymph nodes in the breast/armpit area. LAURA, THANK YOU! I HAVE been wondering why my left pit has more odor than my right (I’m right handed) and I figured it was because my left side had more toxins in it, but that eventually, eating better and not using conventional (toxic) deodorant, it would catch up to the right side, but now I see your answer and it makes so much sense. So, I have to work at getting it caught up to the right side. 🙂 Thank you, again! Will baking powder work instead of soda? I have good aluminum-free baking powder. Do you know if any other clays would be just as effective, such as moroccan red clay or sea clay? I’m not sure but I’d imagine red clay would stain your clothing big time. I have been making my own deodorant for about a year and a half now, with shea butter as my base, and then adding coconut oil and essential oils, cornstarch, etc for the non stinky stuff. Have you tried that? I find the shea butter to be a little….slimy ? I guess would be the right word, but it soaks right in like lotion. I’ve also found that between the shea butter and coconut oil, my clothes NEVER have pit stains anymore, and even after a long, stinky day of working and sweating, the odor from pits and deodorant rinses out of my clothes and is gone for good. I guess my question is, is it slimy and runny? I wanted to mention thieves oil– some ladies had reactions to the baking soda or cornstarch. I actually did, too, for the first 6 months. I assume now that it was my transition from years of antiperspirant and chemical laden deodorants. I used a home made thieves oil, which is highly anti bacterial and very good for the body, with coconut and olive oils, some shea butter….clay would have been a great addtion… and while it made the deodorant a little slicker, I didn’t stink, though I smelled like Christmas spice all year…. 2 years later, though, the little bits of baking soda have made their way back in to my recipe and no longer make me rashy, break out, etc. It seems logical that the clay would thicken up the deodorant, yes? I live in a place that’s 90 degrees or hotter for 8 plus months out of the year. Coconut oil is only ever solid at the air conditioned store. I don’t mind the deodorant being runny, but currently, with the shea butter, it’s like a really creamy conditioner / paste and I don’t have to wait for it to totally soak in before dressing. Is that what the consistency of your deodorant is like? I’m going to try it, either way. Worth it. Thanks for the posts. I came upon your blog today after reading ourheritageofhealth.com’s post, and LOVE it. Thanks again. The recipes are so easy to follow. This is great stuff. I have a hard time using commercial deodorants because they irritate my skin, and the natural ones just don’t keep me smelling sweet. I mixed up some of this and love it. It works! Feels great on my skin, no irritation at all, and keeps me smelling sweet in our hot Missouri summers. To the commenters who noted that the baking soda and/or arrowroot powder burns their skin: I experienced the same problem! I’ve tried the recipe with only arrowroot, only soda, a combo of both, adding Shea butter to the mix, increasing the amount of coconut oil, and so on. It never fails that my armpits are on fire after a few days (even when I went without shaving, thinking it was increasing my skin’s sensitivity). Has anyone found a solution? The only way I’ve had any success is to alternate days between the deod and plain virgin coconut oil (the latter of which only kind of works). If anyone has a better alternative, please let me know! Hi Nadia- I’m excited to give this a try, but after reading some of the comments regarding the pH level of baking soda, and the warnings against it, what are YOUR thoughts?? I didn’t see any comments from you responding to some of these other remarks- but I would like your opinion. Thank you! I must thank you so much for this recipe I have been searching for the perfect toxin free deodorant for a while now and I love that I can make this myself. Not to mention that fact that it is an anti-antiperspirant and actually works! I made some for my mom because she told me that her lymph nodes have been hurting and she said they were hurting less with just one use! How long does this exact recipe last you? what size of container would perfectly hold it? 4 ounce? Had anyone tried replacing baking soda with aloe Vera gel? I haven’t read through all the comments but wanted to make sure your readers are informed that you can not use metal to mix or store bentonite clay. It might be good to add a note to your post. This. Ight be why some are having issues with their recipes. Thanks for all the great info! I have noticed people complaining of various ailments when using this recipe. We should all realize that a detox element like bentonite clay will cause some issues that pop up due to all of the toxins being expelled from the body. Muscle soreness, rashes, and other issues may be due to the body being detoxed. Sometimes the detox can take a little bit of time, At the end of the detox your body will be truly clean and you will feel great. (feeling bad when detoxing is called the herximer effect). Just think about what is happening with the toxins that you may have been putting into your body for years and are now being actively removed rather than sitting in your system waiting to develop into disease. I commend all that are taking an active role in their health. YES! Thank you so much for posting this! Whipped up a batch a couple weeks ago and I’m never going back! I’ve always tried to use natural deodorant but since I moved to Asia I’ve found it really challenging to keep this up. I haven’t found ONE woman’s deo that doesn’t have aluminum except for spray-on deo which has butane and all kinds of other nasties. This deo is fantastic though, easy to make, feels amazing and even during the a Thailand summer that’s 100+ degrees every day with extremely high humidity I still smell nice! Still, because of said 100+ degree weather the coconut oil is NOT solid when left out so it’s kind of a gross process to apply it unless I leave it in the fridge. However, in spite of the water-absorbing properties of the corn starch (unfortunately no arrowroot here) and clay, I still inevitably soak through my shirts which is very embarrassing. Is there anything I can add to the recipe to help with this problem? While reading through every comment, my thoughts on why some ended up with stains was from the detoxing. Beverly – above – said it very well. I have taken notes on the comments to send to my daughter along with her first batch of homemade detox deodorant, so that she can be informed if anything unusual happens. I am so excited to try this myself, too! Thank you, Nadia! Truthfully, I think people have a reaction to the baking soda, not the clay. This is common in natural deodorants with baking soda since it can throw off the pH of the skin. If this happens, you can “reset” the pH by applying some ACV diluted in water. This should help fix the problem. I make a similar deodourant at home, the only difference being mine doesn’t have bentonite clay (which I’m definitely going to try). I’ve found that adding a few drops of lavender essential oil as well as the tea tree oil, really ups the ‘deodourizing’ aspect of it. As for some people being sensitive to baking soda, I have heard you can make it with either less baking soda/more arrowroot powder (my recipe is half and half of each), or with just the arrowroot powder. I would just keep in mind though that arrowroot powder is a starch and can make any yeast rashes worse. My favorite part is knowing that Im detoxing from a lifetime of conventional deodorants with the bentonite clay. Part of me misses the stick deodorants so I wonder if anyone has experimented with adding beeswax to this recipe and making it in stick form? In reply to Trish, this fits perfectly in a pint sized mason jar (the small jelly jar size). I just made a recipe very close to this one and used Moroccan red clay. Looking at it I realized that it may very likely stain my clothes (not sure why I didn’t think of that before making it!). Anyway, has anyone used red clay, and does it stain? I’d think if it didn’t stain, it will at the very least make your clothes look red in the meantime. Ahh YAY!! Let me know how it goes and how you like it! Sorry, I forgot to ask if you leave this deodorant on all day? I know the bentonite clay is drawing out toxins and I’ve read that you should leave it on 20 mins – half hour and then rinse it off. I don’t use the clay. I do perspire a little, but I can handle that. My underarms have never been softer; but I also had laser hair removal several years ago so my pores are very small now. I also used a combination of tea tree and camphor oil, which I use for cuts and scrapes. The smell is a bit strong when mixing, but dissipates after. I use cold pressed, unrefined coconut oil in my mixtures. It may be something else in the soap causing the problem. Hi!! excuse me, i want to try this but can i add beeswax to pour it in an old deodorant container?? i read in previous post about you trying that, have you try it yet?? do you know how much beeswax should i add?? Thank you! I am dying to try this, and was wondering how much this actually makes?… I looked at the link to the jars you use, and was wondering does this only make 1 jar, or more – since they come in a set of 12? Instead of baking soda (bc it irritates my skin), I used an equal amount of arrowroot powder. The mixture solidified nicely in an old deodorant stick container (Secret brand). I also added some vanilla and peppermint essential oil. Next time I’ll try apple cider vinegar in place of some of the coconut oil bc I still have some body odor happening w/my current mixture. I used a similar recipe but added a bit of beeswax and poured the liquid mixture into an empty deoderant tube. It glides on just like a regular deoderant after setting up. I love it!! Please don’t delete this comment, it might save somebody’s life. Present the information out and let people decide whether to act upon it or not. It is not my intention to criticize you or to debunk suggestion #10. However, even you, Nadia, might not be aware what “CASEIN” found in dairy does to your health. Please watch http://www.ForksOverKnives.com and/or read “The China Study” by T. Colin Campbell. If you chose not to post this comment it might suggest that you have ties to the meat and dairy industry. Love your website! Thanks for all your work. LOL no ties to the meat or dairy industries (though I don’t understand why this comment was posted here and not under a different post)! Some people really cannot tolerate dairy but I can (every *body* is unique) and find that raw dairy has done wonders for helping to heal my digestion and benefit my overall health. Plus raw, grass-fed fairy is so incredible rich in the fat-soluble vitamins in which so many individuals are unfortunately deficient today. In response to your book suggestion, I suggest “Eat The Yolks” by one of my personal favorites Liz Wolfe. Thank you! I can see we differ on our beliefs on dairy 🙂 but I’m glad you enjoy it! I’ve had a sudden body odor issue (probably stress, I’m not sure), but my normal deodorant was failing me. After a few days of catching whiffs of myself, I desperately rubbed some coconut oil on my stinky pitts. So far so good! No odor! Here’s to hoping it lasts. Maybe I’ll be a lucky one who can get away with just the oil. If not, I’ll give your recipe a try! That is A LOT of baking soda! for all those experiencing burns, cut it back and or replace it with something like Diatomaceous Earth (food grade). If it is the arrowroot or cornstarch affecting you replace with orris root powder. Make sure you are not using metal when working with clay, it neutralizes the charge you were trying to take advantage of. And last but not least add as much bees wax as you like, if you like semi-soft use less, if you like hard use more. Should also be noted that burning can come from the tea tree oil as well. This stuff works awesome, but day two and my armpits are on fire. Seems from the comments it could be too much baking soda so I guess I’ll try adding more of the other ingredients because otherwise it’s great! Will this melt if it’s not in a glass jar? Other recipes I’ve found, you can put the mixtures in deodorant tubes…which I already bought. PS: I’ve had Bentonite clay for years that I used for facial masks. So excited to learn of other uses for it! Well since coconut oil has a melting point of 74 degrees, it will melt if it gets above that temperature (so in other words, it has nothing to do with the container). Hey Nadia – thank you for the post. Will try this out and let you know how it goes! My daughter is hooked on an all-natural brand called Lavilin, but I will get her to try this too! I just made this deodorant this weekend and I can’t wait to give it a try. Once I poured it into the jar and it hardened I realized that I’d rather have it in another container. Would it be a problem if I re-heated it and then poured it into the container that I want it be in and let it solidify again? Thanks for your advice and help. Hmm I don’t think so! I’ve done it a few times and have had no issues. The baking soda was too strong for me so I’ve been melting it down and trying to get it to a point where it doesn’t burn my pits. I just kept turning it until it came out of the plastic deodorant bar and melted it over the stove in a double broiler (stainless steel is ok for the clay). I’ve also had to microwave it in a glass jar but just keep a close eye as it melts fast. This recipe is amazing! I’ve tried so many natural deodorants, they work for a bit then they give up on me. I used this last night and even before bed, and no odor! Woohoo!! I make deodorant with zinc oxide powder. It works really well and it is anti rash. Since its the active ingredient in diaper rash ointment. I bought a bag that will probably last me years for ten dollars off amazon.com. just a thought for a substitute to baking soda or cornstarch. With using coconut oil, does it leave grease marks on the underarms of tight fitting shirts? I have had a little bit of this… castile soap applied right to the fabric takes care of it. A few years ago, I started getting itchy on my neck. I mean really itchy. Then it spread to my underarms. The doctor couldn’t figure out what was wrong, so I started experimenting. When I quit using deodorant, the itch went away. Then I started using it again and it came back. I will never use regular deodorant again. I tried lots of natural deodorants before I found one that helped the odor somewhat but didn’t last very long. At least it didn’t make me itch. Then I found a baking soda recipe and tried that. It worked, but not for long. Then I used witch hazel and lemon oil. That works pretty well, but nothing has worked as well as this recipe. I keep smelling better every day. I have used it about a week, and so far, I love it!! Thanks! WOOO HOOO! So happy to hear that 🙂 Hope it keeps on working for you!! I really liked this recipe except ……. Now that its summer and hot here in Michigan the deodorant is literally dripping from the container when I go to put it on (liquid!). I tried this out and it works great. 🙂 Really pleased with this deodorant, thanks for sharing the recipe! I’m 60 yrs young and for the first time in my entire life am dealing with B.O. It is a chronic condition, after every meal, snack or drink, have a warming all over and then comes the B.O. smell, it seems that I’m washing my pits constantly.. It is a very strong smell, I don’t know what’s wrong with me… Some kind of plague. I’ve used this formula now for 4 months. It is amazing. I can’t thank you enough. Since each batch is maybe $.50 my pocket book thanks you as well. More importantly, the health of my body is better for it rather than allowing unknown toxins in. Grateful! 🙂 🙂 🙂 That makes me so happy to hear! Could you put this in a deodorant tube? I want to make some for my son and send it for his gym locker. Yes, if you add 2 teaspoons of beeswax pastilles it will firm enough to put in a tube. I can’t thank you enough, this is the best deodorant I ever tried, I been using it for a year now and it never failed me, even at the gym! Thank you so much! YAY!! That makes me so incredibly happy to hear! Hi – what size jar did you use/how much did it make? I am trying to see if I can use the smallest ball jars I’ve come across – thanks! I think they’re just shy of 4 oz. Well it depends on the temperature of wherever you’re keeping it. Since coconut oil has a melting point of 74 degrees F it can be melty during the summer. If you want, you can add some shea butter or bees was to keep it solid in warmer temps. Did it wind up solidifying for you or no? I just mixed up a batch! I think my arrowroot powder is a little old, but since I’m not going to eat it, I think it will be okay. 😉 Just wondering, have you had any issues with the deodorant staining your clothes? The bentonite makes it so dark! Try adding a little more coconut oil! I have been trying to get rid of commercial deodorants for over a year. I have about 15 natural deodorants in my cabinet. They only work for a few hours and I begin to smell like a hoagie. What am I doing wrong. I want aluminium out of my life!!!! I was able to endure a greasy scalp for about 2 months when I got rid of chemical – laden shampoo but body odor is a no-no!!! Will this clay help??? Oh no! It’s most likely the baking soda — some people are sensitive to it. You can make another batch with less or no baking soda, or try to rebalance your underarms’ pH with some diluted apple cider vinegar. I made mine last night but it looks more like salve. I think I put too much coconut oil because I see an oily film on the top too. Lol. Do you think I can maybe melt some beeswax and mix it in so its more solid?? Thanks ! Hey, Jamie. Yes, it is a cream so may seem salve-like. Yep! A tablespoon of beeswax should do the trick! Ohhh you’re in CA! Yes, since coconut oil has a melting point of 74, it’s probably super liquidy for you! Some beeswax will definitely firm it up. And YAY!!! That makes me so happy 🙂 Healthy, non-funky pits are the best! Hi! First let me say I love your website!! It is filled with so much wonderful information! I’ve found several things I am going to try right away. I have even directed my mother and sister to your site. I am hoping you can help me with an issue I’m having. I have bags and slight darkness under my eyes. Do you have any suggestions on how I may be able to deal with this? Please keep up the wonderful work you are doing by providing so much great information! Thank you for your help! Hi! I’m so glad you posted this recipe. It has worked wonders for my kid when I wasn’t sure how to maintain the under arm odor in a natural way. I recently started using Aztec clay for a face mask so that was how we had everything on hand easily. The night before we used the deodorant we applied the clay just mixed with apple cider vinegar to make a paste all around the under arm area to get a detoxed clean start. The day after, applied the deodorant and was amazed at how completely odorless she was by the end of the day. The only discomfort was from more sweat than usual, but it was clean sweat because there was no smell. I understand that in the absence of the chemicals from traditional deodorant there may be more sweat. I’ve already recommended this recipe via link to friends and family. Thanks again! That’s a sure different ingredient list. Just wanted to let you know I love love love this deodorant, and have been making it for some time now. For any Aussies, my favourite clay is here – http://healingclay.com.au. I’m not affiliated, I just know how hard it can be for us to get these special types of products sometimes. I also like to ‘tone’ my armpits with apple cider vinegar toner prior to applying. It’s the same toner I use on my face – 1 part ACV to 30 parts liquid (water, rose water, orange blossom water, etc.). I was wondering if I could use another clay instead of the bentonite clay? Or maybe activeted charcoal (as it also pulls toxins out of the skin)? Or simply don’t use it? Just leave the clay out (although it’s a great staple ingredient to invest in). Definitely DO NOT put activated charcoal in deodorant! It would stain all of your clothes. Hey, Anna! Awesome, thanks for sharing this for all the other Aussies. I have enjoyed looking through your blog~ lots of good information. The deodorant recipe will be something I try. I like the storage jars that are shown, would you mind sharing where you purchased them as well? Hey, Melissa! I’m so happy to have you as a new reader 🙂 Great, I hope you love it!! Hi, i have been told by my doctor and a surgeon not to use antiperspirants any more due to reoccurring abscesses under my arm. They say that the antiperspirants are blocking my pores and sweat glands causing a golden staff infection resulting in the said abscess. I have just had a 3 day stint in hospital due to the infection spreading from arm pitt to elbow. I have been looking for an alternative to antiperspirant and will give this a try now. I HIGHLY ADVISE you discuss safer options with your doctor. I’m not sure that the bentonite clay is a good idea for you. Perhaps you could try just coconut oil? Coconut oil has natural antibacterial properties which may be beneficial to you. You may find that the oil alone is enough protection. Hi, I’ve been using your detoxifying deodorant for at least a year now and have absolutely loved it. Until recently. All of the sudden I started stinking. My diet hasn’t changed at all. Is it possible my pits just got too used to it? Any suggestions? Hi, Michael. Oh no! The one thing I can recommend trying is applying some diluted apple cider vinegar to your armpits (with a cotton ball or spray bottle) a few times (like maybe everyday for a few days) to try to help balance the pH of your pits – that could be the issue. That sounds interesting, Emily! I’m just wondering if the witch hazel will mix OK with the shea and coconut oil (since it’s like mixing oil and water). Let us know how it goes! Can this deodorant be put into a stick and used that way? Or is it too soft? Thank you! It’s too soft, but you can just add some wax to it to make it work! I made your detox mask , which I LOVE ! My daughter had a deep pimple no over the counter product helped. We did the mask and it drew it out! We were very happy. Sorry didn’t mean to ramble lol. My question is this.. I’m going to attempt to make the deodorant recipe . I have tapioca flour [ tapioca starch] on hand could I use that instead of arrowroot? Awesome! I’m so happy to hear that. Hmm I’m really just not sure. Corn starch (I suggest organic) would work but I’m not familiar with the consistency of tapioca flour. The bentonite clay you link to is in power form. For all of your DIY when you use bentonite clay are you using the powder or are you mixing with water like it says on the packet? I’m assuming for the bath you can just sprinkle the powder in. But for the deodorant do you use it dry or make it a wet clay first? And for the face mask? No, I just mix it dry with the other ingredients listed. So I finally made this. I added 5 teaspoons of bees wax and mixed with coconut oil in a melted state. Then I let it cool a bit and added the dry ingredients and the tea tree and bergamot. Smells crisp and clean. I poured it into a deodorant stick and it glides right on. It does still feel a bit grainy though. Do you think I should add more coconut oil or would it be smoother to add shea or mango butter? I never leave comments on websites, but I’m so in love I felt compelled! This is amazing and I don’t stink after even 24 hours! I’m blown away! Thank you for sharing, I keep passing this website along. The natural deodorants I bought just didn’t work, I stunk like sweat. The spray on EO recipe worked well for a while, but after I remade a bottle it stopped. This one amazes me! I think the baking soda slightly burns a tiny bit occasionally on freshly shaven pits, but it’s totally worth it! I have been using this deodorant for a couple of months now after switching from a commercial brand. It has worked wonderfully! I was a bit stinky the first week but after that I have stayed dry and perfectly pleasant smelling 🙂 The ONLY issue I have is that my armpits are really dark now. Any theories on why? The detox process maybe? The green clay?? Thoughts? Huh. I have no clue! You mean your actual armpits and not the armpit are of your shirts, correct? Any way to make this less abrasive? It gets to feel like sand even with everything finely ground! Hi Nadia! I just made this and put it in deodorant containers. I know coconut oil will melt this summer, but could I keep this in the fridge??? Thank you! Hey, Crystal! I’ve never done that myself but I’d assume so! Please let us know if you try it 🙂 Also, you could add some beeswax to keep it firm even in the summer heat. I’ve done my batch today. I used a plastic spoon so it fitted perfectly to a small vaseline 50ml tub. I’m excited how good this product because I read about it a lot. I link to where you can buy some online in the post! I’ve been using a diy coconut oil base deodorant for quite some time and loving it. Until I decide to make a batch with clay and regretted as soon as I apply it for the first time. Now I have green-ish armpits. Definitely not for me. Hmm bentonite clay? That sounds odd to me. Thanks for all of the wonderful ideas you share with us. I love your website, and this deodorant too. I’ve made it a few times now, but started to realize that the coconut oil combined with the bentonite clay stains my clothes. Do you have any suggestions for either substitutions or ratio adjustments, to avoid stains? I recently ditched all my crazy scented soaps and chemical full deoderant in attempts to relieve some long standing underarm odor problems. I was reluctant but I threw it all away and made this recipe you shared to use as my new deodorant. In addition to this I began doing bentonite clay detox on my underarms a couple times a week. Well, I have been completely odor free now for over a month! I’m amazed. I LOVE this deodorant. Thank you for sharing it. The only issue I’m having is a rash like iritation in underarm area now. It looks like razor burn/ small red irritated bumps etc. It’s not itchy but very red and irritated. I started doing an apple cider vinegar spray prior to applying this deoderant but that has not solved the problem either. I’m not sure what is causing the irritation and hoped you could give me some advice. Hey, Katie! Woo hoo I’m so glad you love it! The irritation is likely caused by the baking soda. I’m sorry to hear the ACV trick isn’t working! You can make a new batch without baking soda and see if it still works as well, or dilute the batch you have with more coconut oil, cornstarch, and clay to reduce the amount of baking soda. Great, I will try that! Hi Nadia….is this safe for an 8 teardrop old? Also have you ever used the clay on kids….my daughter just diagnosed with celiac and I’ve read that the clay internally could pull gluten out and help heal. I’ve never used it internally nor have I used it with kids. I’d do some research on that or speak with a functional med practitioner. I’m not sure where gluten would need to be “pulled out” from… doesn’t make much sense to me but who knows. The most important thing is obviously removing it from her diet (and it can be hidden in a TON of different packaged foods). Success!!! I had a really bad irritation/rash with my first use of this. Here’s what I changed….and now I have NO irritation at all and still noooo smell!! 1. I stopped shaving in the morning before applying the deodorant. I shave at night and don’t put anything on my underarms before bed. 2. I put apple cider vinegar (diluted in water) on a cotton ball and rub underarms before I use the deodorant. 3. I do a bentonite clay detox on underarms (wellness mama website) 2x per week. I might even try some diatomaceous earth and some Shea butter in my next batch. I left a comment/question a few weeks back, and didn’t see a response, so I’m re-posting. I’m running out of my current deodorant, so hoping I can make a modification that will solve the stain problem! Looking forward to hearing from you, and thanks for sharing all of these fantastic DIY recipes! Hey, Claire! Sorry for the belated reply. I don’t have any substitutions (except if you want to make a totally different deodorant that doesn’t contains oils, such as those with witch hazel or magnesium oil) BUT castile soap is a life-saver for removing oil stains. Simply spot treat the stains with the soap (so just rub the soap in and let it sit overnight before washing). I hope that helps!! Thanks so much for sharing, Katie! I hope other readers find this helpful. I’ve been meaning to make a recipe for sensitive skin (and test it on my husband who is super sensitive to baking soda!) for those who have a reaction like you described. Could i use it on my 8 year old daughter? She really needs it when she dances. Won’t the clay tighten underarms and leave grey color stains? I am going to make this as I am allergic to Methylisothiazolinone and I will not take the chance of another bad blistering on my body from a chemical preservative, way too painful and takes literally months to clear up. How long does the batch from this recipe last? And should it be in a cobalt or amber container? Thank you for all your wonderful natural recipes. My face is so happy with the oil on it! I have been using this deodorant recipe for about 15 months now, and it works so well I can’t believe it. I smell good all the time, even after working out. And it isn’t irritating at all! Love it!!! Sage is great for sweating, as well, and is anti-bacterial. If you get enough zinc in your diet, it keeps your perspiration from getting stinky. We used to say, “If you take zinc, you won’t stink”. Many of these can be made into solids with the addition of beeswax, as well, melted into the coconut oil or shea butter, whatever you use. I’m experimenting with food-grade alum, as it shrinks tissues like the commercial aluminum products do in anti-perspirants and Preparation H.
I just stumbled across your blog and immediately signed up for your newsletter because I love what you’re doing here. I just wish your DIY recipes were savable like on the food blogs! I’m copying and pasting your whole blog post to Word so that I can save it in my recipes folder. I can’t wait to try it out. Hmm… not an oil. But there are a few spray recipes out there that use magnesium oil or witch hazel. You may want to look into going that route! I love this recipe!!! I’ve read recommended it to so many people! It’s strong enough for my husband too. I’ve been eyeing this recipe for a while. Quick question – did you recently change the picture? I remember it being pictured in a tiny glass pot with green writing. Has the recipe changed too? Let me know please. I’m about to order the ingredients online. Hi, Miti! LOL well I’m glad you’re a returning reader 😉 I did change the photo a few months ago – the other was really old (this was one of my first blog posts!). But no, the recipe has not changed. I hope the recipe works for you and you enjoy it!! I’d suggest trying it without the clay first since it may be all she needs! Just made this and love it BUT it looks to be developing a thin film over the top in the jar. Can it go bad or spoil? I’ve only had it for the a couple days. Seems like odd thing to have happen based upon the ingredients. Any thoughts or suggestions? Did the coconut oil solidify after you made it? Sometimes that just happens to coconut oil which is the explanation I’m leaning towards but if you’re at all concerned, trash it and make another – better to be safe than sorry! And of course, any time you make a DIY, make sure your hands, the jar, and everything you use is super clean as is your workspace. I have only used Kaolin clay for face masks. There are certainly many different recipes for natural deodorant out there! I made a batch today and a few hours after making it the coconut oil turned to complete fluid. Am I supposed to keep this mixture in the fridge? Oh, that depends on the temperature of your house – if you keep things above 74 degrees F then yes, that would be best. You can also add some beeswax if you want to avoid that. You never mentioned that you cannot use metal when dealing with bentonite clay. It makes inactive. This post is a couple years old, but I just came across it and wanted to give it a try. Thank you for pointing this out! I will have to edit it to include it. Ok. So I’ve been holding this recipe for months and finally was proud of myself when I made it the other day. I love the idea of making my own deodorant I wore it yesterday but kept feeling like people might mistake its oder for armpit oder. I kept trying to figure out what it smelled like and realized it smells like Pine Sol…maybe I put too much teatree not sure but if I ever make it again I will pick a nicer smelling oil. I’m concerned about the coconut oil staining my clothes… Oil stains are so difficult, sometime impossible to remove. That’s definitely a good concern! I’ve found that coconut oil doesn’t stain to the extent of other oils but it can leave a mark on clothes, especially over time. But here’s a trick for ANY oil stain: castile soap is THE BEST for removing oil stains! I spot treat with it for a few minutes before tossing it into the laundry. Can you mix this in a metal mixing bowl? No – just as it’s not a good idea to use a metal spoon, a glass or porcelain bowl is best! Just wanted to say I’ve been using this recipe for 3-4 years now and I’m never turning back. I love it so much. I’m allergic to coconut, is there an alternative? If I used some lavender essential oil as well as the tea tree oil how many drops of each should I use? Nadia, did you end up coming up with a recipe without the baking soda? Every version (different essential oils) that I have made of this has irritated my under arms and given me a burning sensation and turned the area red! I read some comments from other readers and wondered if it could be the baking soda that is irritating me. Loved Reading This ! I too already make my own Lemon Zest Deodorant Spray. I have been using green clay- it works great but recently bought some Bentonite to use in another recipe. YOUR use of it here has inspired me to make this D-O for my daughter and niece who suffer from excessive sweating. I Hope This recipe Works! Peace and Blessings! Can’t wait to try this! Do you leave the jar open or keep it covered with an airtight lid? I made this and now my armpits smell like sweat mixed with bentonite clay. I was not using any deodorant before only cleaning armpits with rubbing alcohol or Apple cider vinegar. What did I do wrong?